Many people have been drawn to the boom town of Cashbox for very different reasons. Con Daley, the Silver Fox, has made and lost fortunes plunging on new mines. Sylvie Duvalier, loves the rough and tumble of a fevered mining camp, and the gifted men who flock to it. There's stern Thaddeus Webb, superintendent of a great--and dangerous--mine. And Hugh Trego, miner and union man, wanting a fair shake for his men. May Goode is a woman desperate to escape her past. They all collect in the seething, raw town of Cashbox, Montana, looking for wealth. Cashbox is based on the real Montana silver town of Castle, which bloomed and died in the space of a decade or so. Even now, one can drive there and see the last, tumbling structures, and the rock foundations of the shops that once catered to a bustling town. The Cumberland Mine produced a modest fortune in high grade silver, and even today, glinting black ore is scattered across the flat where the mine stood. In the summer, breezes stir the spirits of those who settled there--for a short while. 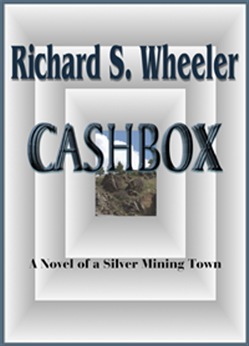 Cashbox was the first of Richard S. Wheeler's celebrated print-edition western mining novels. It was followed by Goldfield, Second Lives, Sierra: A Novel of the California Gold Rush, Sun Mountain, and in 2011, The Richest Hill on Earth. Acquista Cashbox in Epub: dopo aver letto l’ebook Cashbox di Richard S. Wheeler ti invitiamo a lasciarci una Recensione qui sotto: sarà utile agli utenti che non abbiano ancora letto questo libro e che vogliano avere delle opinioni altrui. L’opinione su di un libro è molto soggettiva e per questo leggere eventuali recensioni negative non ci dovrà frenare dall’acquisto, anzi dovrà spingerci ad acquistare il libro in fretta per poter dire la nostra ed eventualmente smentire quanto commentato da altri, contribuendo ad arricchire più possibile i commenti e dare sempre più spunti di confronto al pubblico online.